Eclectric Energies gives instructions for chakra meditations that use mudras and sounds for opening the chakras. 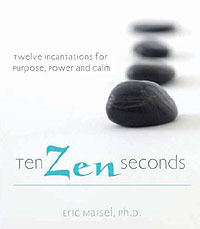 The Thinking and Breathing incantations in Eric Maisel's book entitled Ten Zen Seconds: Twelve incantations for Purpose, Power and Calm are as simple as counting, 1, 2. 1. one thought. 2. two breaths. First take in a deep breath. Second release a cleansing breath out. The thought is a phrase that is to be spoken outloud. The words are to broken down into two parts so that it has a rythmic tone to it. Example: I am open to joy. breath in as you say I AM OPEN, on the out breath say TO JOY. Saying the incantations without visualizing them is my downfall. Eric instructs the reader not to create images in his mind while doing these incantation, but to focus only on the words and the breath. I've been practicing and doing better. I have also created my own chakra-zen incantations that are intended to be used for chakra balancing. as the primary way to keep yourself on track.Where did this idea come from? from the West and breath awareness and mindfulness techniques from the East. competing in the art marketplace, and so on. on their experiences. That was great fun and eye-opening! tested in the crucible of reality. bring mindful awareness to each of your activities throughout the day. in demarcating our activities—and life feels very different when we do. slide show at the Ten Zen Seconds site that you can use to learn and experience the incantations. The slides that name the twelve incantations are beautiful images provided by the painter Ruth Yasharpour and each slide stays in place for ten seconds. So you can attune your breathing to the slide and really practice the method. www.ericmaisel.com, especially if they’re interested in creativity coaching or the artist’s life. using your innate creativity to help in recovering from addiction. it’s something special. So I thank you for having me here today! Welcome to the May 5, 2007 edition of the Carnival of Healing: Weekly round-up of blogs across the Internet featuring information about healing, self empowerment, and spirituality the carnival certainly makes its rounds. Last week the carnival visited Reik4Life Blog for the first time. Next week the carnival will return to Wisdom of Healing Blog where it has become a frequent visitor. Ananga Sivyer, Living by Design posts The Power of One: Mono Tasking. This was the last carnival entry I received (and reviewed) for this week's carnival. I wish I had read it first. Which is why I put it here at the top. Mono-tasking is a great concept. Although I tried to stay on task putting the carnival together, I wasn't Mono-tasking by a long shot. I was Interuptus-tasking.... that is, allowing interuptions. Some were unavoidable, but not all. Gia Combs-Ramirez, The Science of Energy Healing, gets my thumbs-up for her carnival entry Emotions as Energetic Messengers, That might be because I'm on emotion overload today due to time constraints and looming deadlines to meet. Her post helped me to compartmentalize some of my "feeling" eruptions. Gia says "Understanding your emotions as messengers from your energy body can help shift how you work with them. Discover the meaning behind five emotions, from an energy healer's perspective." Gary van Warmerdam, Happiness Blog. posts Not Ready to Heal Emotionally. This is an interesting read about how we can't allow our fearful feelings to interfere with us taking action in our personal healing journeys. We have to be willing to swing the bat before we can hit a home run. Nice, thoughtful post. Kara-Leah Masina., writes a heartwrenching post How to survive near-drowning in an ocean of tears revealing a difficult patch of time she struggled with, and continues to struggle with. But the clouds are clearing. Weight Loss Dude, James D. Brausch posts An Apple A Day? sharing an Internet supplier of organic apples. Granny Smith his favorite apple variety. Mine too!! Tart and Crunchy! JoLynn Braley from The Fit Shack, made my taste buds quiver nervously while reading her post What is the Ingredient “Natural Flavor”? She says "The ingredient "natural flavor" is prevalent on everything from so-called health drinks to ground turkey. It isn't as natural as it sounds, though." Eewww. Conan Stevens presents Breakfast - The Most Important (Bodybuilding) Meal Of The Day posted at Bodybuilding Muscle, saying, "Breakfast, the forgotten medicine. Too many people in modern life skip breakfast and then find themselves overweight and energyless from eating 'quick' foods as hunger overtakes their thinking" He suggests unflavored oatmeal, fruit, and eggs for breakfast. I guess my leftover pizza and orange juice this morning wasn't the best choice, but at least I ate something. I am a recovering breakfast-skipper. I suppose I should have expected a brief and simple post from a blogger of a blog entitled Tao of Simplicity but it surprised me none the less. Praveen posts Garbage In, Quality Out which "simply" teaches us not to pass on negativity. Whenever you've been crapped on, discard the dung... don't react by shoveling more of the same onto others. Addiction Recovery Basics. outlines 7 Tips For Spirituality, Making A Connection - The tips are simple, they have a holistic feel and balance to them. Bill Urell, says "Addiction recovery and spirituality can be viewed as the process of becoming connected. The more connections in our lives, the greater the chance of coming into harmony with our surroundings." Julee Hoy,Homeschool Daze, journals her and her husband's decision to be tested as possible organ donors. The post journals the need for a transplant, the prayer requesting a donor, making the decison to be tested, which all resulted in her husband being a match. Motivational/Empowerment Coach Debra Moorhead answers questions from her readers about knowing what you want and how to go about chasing those dreams in her post Your Magic Wand. Jenn Givle, Thriving Holistic Business, posts Are You Open To Receiving? Jenn says: "We know that the Law of Attraction brings us what we put our attention on. But, are you open to receiving? Being open to receiving is a critical piece to the puzzle. This article talks about what it means to be open. Then, we discuss how to tell if you are open." Alvaro Fernandez, SharpBrains, posts his Mind & Institute notes from a training experiment, in the form of a breathing & meditation retreat, with some neuroscientists and Adam Engle, Co-Founder and Chairman of the Mind & Life Institute. Cardin Lilly Routh, OptmistLab.com, offers two posts this week. Remembering What I Once Knew and Keeping Your Precious Things Precious. Meredith, Reiki 4 Life, shares a somewhat rambling post, The Healing Body. My definition of "rambling" is Thinking out Loud With Unformed Opinions but in this case, writing out loud. She is using her blog platform as a self-healing process. She's working stuff out in her mind and body. And at the same time, giving others something to think about. She says" by becoming mindful and shifting our focus to the Lessons instead of the specific teachers...we can learn our soul lessons and healing can occur in a more kinder, gentler fashion." David Maxwell, Medical Health, posts a consumer education post regarding using room temperature Emu Oil. Phil for Humanity, offers suggestions for Reducing Stress. Phil says "All to often, I see people around me looking for short term solutions to stress, such as taking “must needed” vacations, and then they go right back to their hectic and stressful schedule immediately afterwards. I equate this with yo-yo dieting that does not work in the long term. Handling stress must be a lifestyle change that minimizes everyday stress." Aparna, Beauty and Personality Grooming. posts yoga poses, Sitali and Sitkari Pranayams to cool your body in summer. Aparna also suggests home remedies for sore throat. Christopher Depelteau, MRI LINKS AND OTHER COOL THINGS, posts about rare disease, Erdheim Chester histocytosis. Christopher says, "The Radiologist working that night said to me a few words I'll always remember. He said, " this is the rarest case you will see over and over and over again." Albert Foong, Urban Monk, posts What your ego is and how to stop it from obscuring your inner peace and unconditional love . This is a lengthy blog post broken down into 8 separate pages.. Rather than a blog I'd call it a bloga (blog saga). There is a lot to read. I'm afraid I didn't have the time to read the whole thing. My job as the carnival host is to review all the entries, but I failed getting through this one. I'm certain it will be a worth the read when I have more time to give it. Admittedly, Al says "This is by far my longest, favourite, and most heartfelt article ever." Why I Learned Reiki blogged by Lexi Sundell at Energies of Creation, I'm always interested in what leads practitioners to the practice of Reiki. Lexi says it was due to recurring problems with her husband's "out-of-rhythm heart" that led her to Reiki. Having A Ball In Your Office. Dianne M. Buxton, manifestingsuccess posts Healthy Office Space Workouts which describes mini-workouts at the computer while sitting and bouncing on a physio ball. Raymond David Salas presents The Powerful Benefits of Walking posted at ZenChill.com Power Tools Blog. Well, folks, this concludes this edition. Thank you for your attendance. And a special thanks go out to bloggers for their contributions. See you next week!